Youre not from the cool school, you, youre the Steamer! So said Oscar Peterson poking our featured artist in the chest after a Jazz at Philharmonia concert. 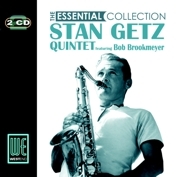 The artist in question is Avids latest inductee into the Essential Collection series, Stan Getz. Getz was not an innovator like Charlie Parker or John Coltrane but he had one of the most recognisable saxophone sounds in jazz. Enjoy this set as Getz leads off with his Quintet ably assisted by long term collaborator Bob Brookmeyer.